Happy Monday Folks! Another weekend, gone, so quickly! I had a lovely relaxing weekend. If we’re friends on Instagram you may have seen that i am the proud new owner of a sewing machine. My sis came down to assist me on Saturday as she’s quite the pro and we potched about with it. And then…. Then i was on my own with it. And now i’m scared of it! I need to do some reading up i think as it is not coming naturally let me tell you. But i’ve only had the thing 2 days, we just don’t know each other well enough yet. So i’m booking us a 2hour date together this afternoon to get to know one another better. Wish me luck! I flippin’ love this dress. It came with the most amazing vintage elastic white and red belt which, on the day of wearing the dress, little to my knowledge, my son had stashed the belt away in his toy box. I was so sad!! But alas mama bear has found the belt and restored to its rightful place. And is it me or are my legs getting whiter? Seriously, i’m going to be translucent soon. Come on Britain, show us some sun! Next Post Love or Loathe…. Love the dress, and wahey for the new sewing machine. I spent most of my Sunday teaching kids how to use one yesterday, as part of our camping skills day for the guides we are taking away next week! Oh wow this dress looks stunning on you! You really suit red! Gorgeous dress – it looks fab on you ..
Eeeeekk that is just the perfect dress in every way! I am straight on that eBay seller. I hope you become friends with your sewing machine =) it's a skill I would love to pick up! I am keeping the link of the Ebay shop for the future. I mostly love the hair wrap! 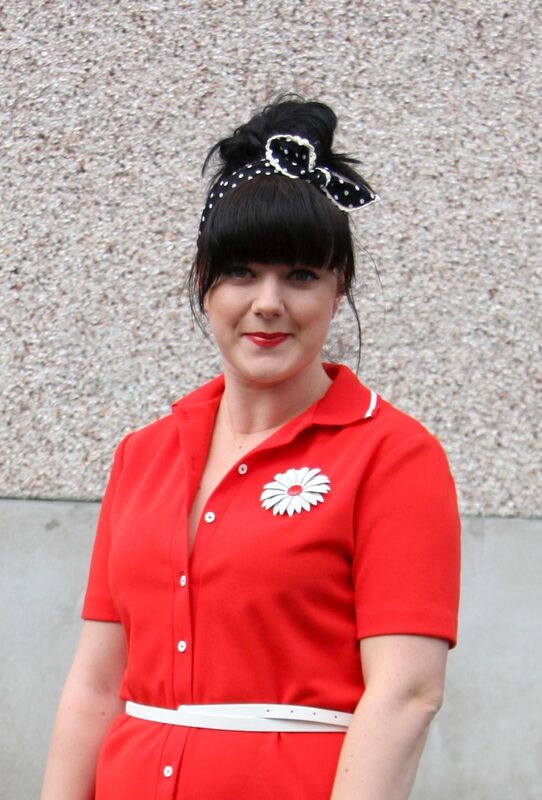 I just bought a similar one on Etsy; I like the rockabilly look. Mum, if you're reading, I say hi too!! 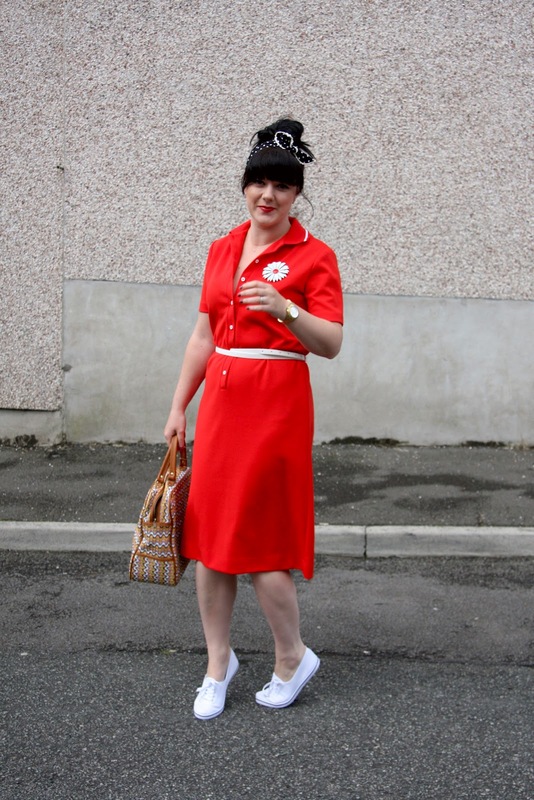 What a fab dress – and the sneaks and hair wrap give you the perfect retro vibe, while still modern. Thanks so much for linking up with Visible Monday! 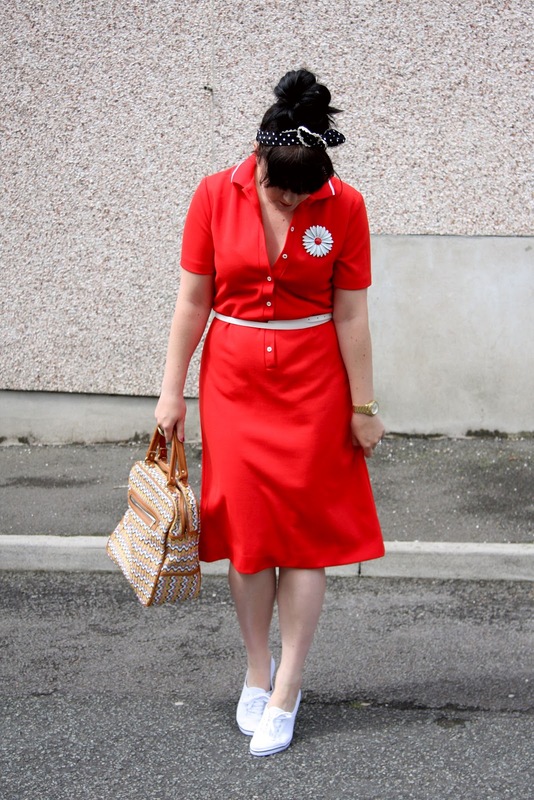 I am so envious of everyone who can wear red well! so cute 🙂 look gorgeous in red! Good luck on your sewing machine date! This is such a bright, sharp look. It's no wonder you get compliments! And congratulations on the new, but scary sewing machine. You look so gorgeous in this dress. Thanks so much for your business and hope to see u soon at Retro Rainbow Vintage! ps some gorgeous dresses on their way from the States as we speak so keep an eye out on my shop! 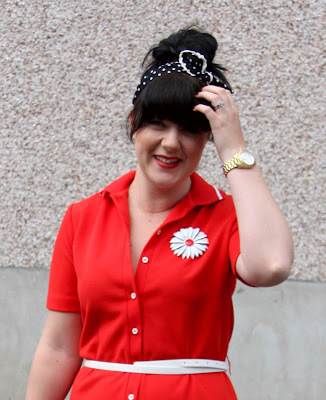 This outfit is so retro rad; and it makes you look effing skinny!!!! And that's all I have to say about that. Sorry………had to comment again! THIS DRESS IS AWESOME!!!!!!!!!!! And thank you for dropping by the blog! Love that vintage brooch. Thanks so much for sharing on Monday Mingle. Love the scarf! So adorable!